I am not a good photographer -- most especially not with a camera phone. 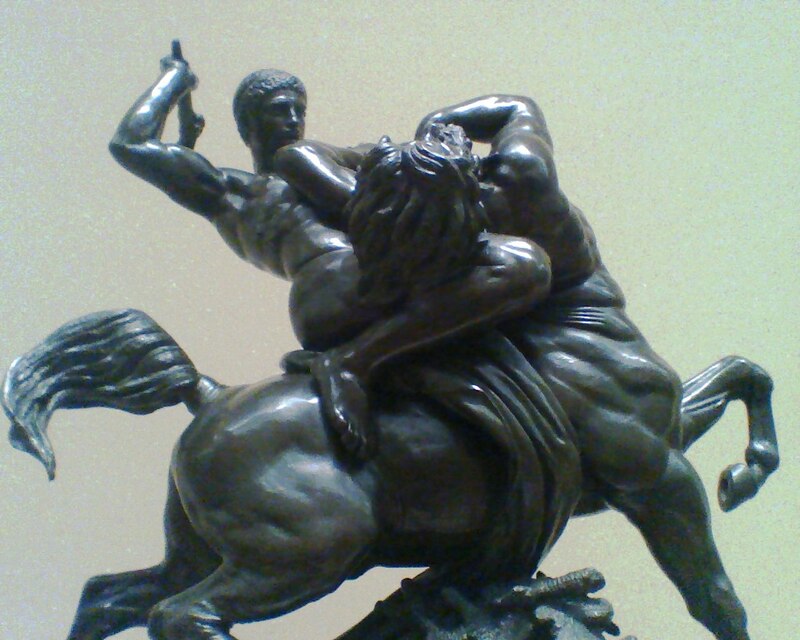 But we work with what we've got, and I couldn't just ignore this bronze of Theseus versus a centaur. And besides, it's fitting really -- a bronze age hero cast in bronze. This sculpture is one of the reasons I need to get back to The Met. It deserves much better photography than my phone was capable of at the time. I'm not sure that Theseus really had any personal stake when it came to the Centauromachy, beyond simply being present at the wedding of Pirithous and Hippodamia. But I'm certain that if Pirithous had called on him for support in any war, Theseus wouldn't have hesitated to answer. The proof is in their trip to the underworld, when Theseus accompanies Pirithous to steal Persephone from Hades. In the end, only one of our heroes comes back. Eventually, Theseus is fished out of Hades' chair of forgetfulness by Heracles. But that last adventure with Pirithous cost him (among other things) his kingship. I can't help but wonder if he ever thought back on that day and said to himself: "Well, it seemed like a good idea at the time."